What Are UK Universities Doing With iTunesU? Two years later how has iTunesU developed across UK higher educational institutions? Are the Open University and UCL feeling slightly embarrassed, like the institutions which decided in 2003 that the future lay with Gopher, or feeling pleased that their institutional commitment had identified an important technology, as was the case when Leeds University set up its institutional Web service in January 1993? There is much that can be learnt from the experiences of early adopters. 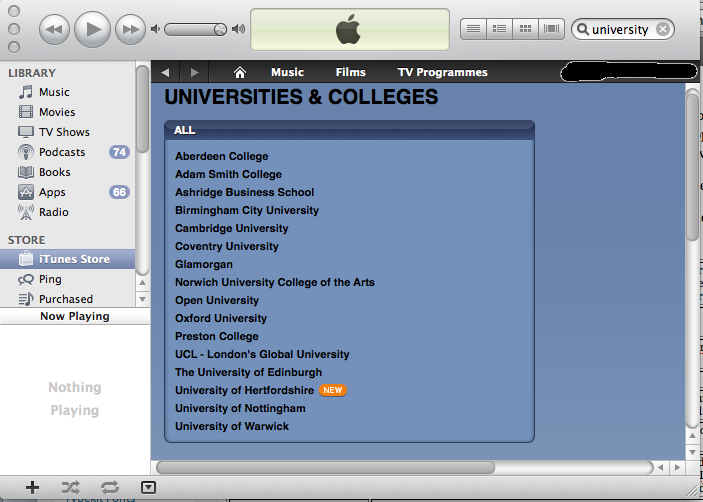 Using the iTunes software you can see a display of Universities which have an iTunes U presence. These can be selected by country as shown below. From this we can see that there are currently 16 UK universities and colleges which provide multimedia resources which can be accessed via the iTunes software. Using a Google search for “itunesU university uk” I looked in some more detail at the information provided by a number of these institutions. A summary is given in the table below. 9 Birmingham City University on iTunes U “Where does Birmingham City University fit in? Birmingham City University has collected a wealth of audio and video material from across the University that can now be accessed via iTunes U and through http://www.bcu.ac.uk/podcasts. Does it replace internal sharing systems such as Moodle? It is interesting to read how these institutions are described their use of iTunesU: a number of institutions are highlighting the amount of content which is being provided (“over 280 albums with content from over 136 courses“,”more than 400 audio and video podcasts“) or accessed (“over 3 million downloads“) whilst others point out that the content is available for free (“This free service allows you to access interviews with academics, programmes about research at the University, lectures, teaching materials“, “you can download educational multimedia resources free of charge“, “you have access to hundreds of free educational video and audio podcasts“, “Download videos and podcasts of University lectures, public talks, conferences and tutorials for free“) or combine the quantity with the free availability (“more than 400 audio and video podcasts from around our campus for you to download for free“). Interestingly one institution points out that “You can also download pdf documents“. And whilst another answers “no” to the question “Does it replace internal sharing systems such as Moodle?” this is qualified with the words “at present“. Might iTunesU in the future have a broader remit than simply providing public access to podcasts and vodcasts, I wonder? A more important question will be the impact which iTunesU could have across the UK higher education sector in the future. The institutions which have been early adopters cover a range of institutions: we shouldn’t be surprised that a distance learning organisation such as the Open University being one of the first two institutions (who launched their presence on the same day as UCL) to make use of iTunesU. But we also see high profile and well-established institutions such as UCL, Nottingham and Edinburgh Universities in the list of early adopters alongside a number of newer universities and former polytechnics. Now I suspect that the reality of providing institutional use of iTunesU isn’t quite this simple. But neither will be use of an in-house service for providing access to audio and video recordings – especially on mobile devices. After all, which application are students (and staff) be more likely to be familiar with: iTunes, a home-grown synching application or a synching application provided by a CMS or VLE vendor? Are the institutions listed above to be applauded for providing a user-friendly and cost-effective solution at a time when cost-efficiencies, in particular, are the order of the day? That seems to have been the feeling at Oxford University judging by the notes taken of an “iTunes U briefing on podcasting and mobile learning – a day at Apple” held last year: “Downloads have been enormous, iTunes U is global. Good ‘metrics of success’ 150 feeds of mostly 1h lectures“. Or will institutions which choose to make their content available by a commercial company eventually regret this decision, with perhaps a lack of flexibility in integrating multimedia content with other institutional services? Can iTunesU content be easily synced to Android, Nokia, Blackberry, Windows Mobile, etc? There may be 3rd party apps that help, but do they cover password-protected iTunesU content? Do universities support such workarounds? If not, how do universities ensure that people who have chosen to buy something different aren’t disadvantaged? Also – those who have investigated use of iTunesU know that Apple make fairly strict demands of institutions that some rile against. They insist on clear project management on the part of the institution to ensure that “quality” is maintained. You could say that they want to make sure that you make them look good :). I’m not saying this is a good or bad thing (I could argue passionately either way here) but folks should know that it’s not a simple case of applying for an account and uploading content. In contrast to, say, Google, that sees itself as a transparent supplier of services, Apple acts like a record company with all the global distribution channels sown up, and your institution is just one more “creative” hungering for the big time. Of course if it works, why fight it? It’s the same dilemma the world over. I’d be interested to hear people’s opinions on this. Institutions like mine that don’t use iTunesU can be sniffy and say it’s the wrong direction in the long run, but until we provide compelling alternatives it’s hard not to feel like your just sulking. Even so – the way to make content accessible across platforms remains the same: the web. For open source web-based “independent label” alternatives to iTunesU consider Opencast Matterhorn and the Kaltura Community Edition. iTunes are attempting to co-opt the OER movement. As is the Apple way, they dazzle us with a shiny UI to distract us from the fact that what they are offering us is a closed, Apple-managed ecosystem. There are rules about what you can put on to iTunes you – in typical Apple fashion it is to “preserve the user experience” When governments try to restrict educators, we march and we boycott. When Apple do it, in 8pt Helvicta with a check-box at the end, we march in happily with our eyes on the shiny stuff. And now we’re in, how do we get out when those conditions change again? I can understand why University marketing teams are interested in iTunes U – it’s the benefits of OER, tied in to a globally recognised brand (maybe some of that cool will rub off, huh?) and none of the concern that you are actually giving content away for others to reuse in forms you may not approve of. I’m at a loss why academics and learning technologists are so keen. Maybe I should buy an iPhone – would I understand then? 2) users who don’t own Apple hardware can access the same content via other routes (e.g. thru some kind of Web interface). I struggle with both arguments tbh. With 2) I worry that the overarching emphasis of sites who have bought into iTunesU is that they have bought into iTunesU – the other routes to content are presented as secondary to that. To me, that implies that users and lecturers who choose to use that route are somehow second class citizens of the institution. But, I accept this is partly a religious argument and I’m probably being unfair. I’m happy that individuals opt to buy into these kinds of systems – I do myself for example – I think it is more of a concern when large, supposedly ‘open’, institutions do so… in much the same way that opting for Microsoft-only solutions was not a good thing in the past. I was under the impression that Oxford have (or had!) two members of staff working full time on their content for iTunes U, plus built a completely custom web interface. Also, I’m trying to work out what the benefit of syncing the content really is (as opposed to it just being available, regardless of source) – who would be doing this? I’d love to have figures. Thanks for the comment. I recall the discussion that took place several months ago. That discussion took place in an environment which has not been Web-friendly and not open to Google – perhaps illustrating the point that popular and well-used services are not always those that implement best practices. I’ll address the openness question – which @Dkernohan in a forthcoming post. I agree with you – it would be valuable to have evidence of the costs of implementing and developing such services, as well as understanding what the tangible benefits of such work is. I hope that such questions will be answered following the recent iTunesU event held in Germany. If I find any relevant posts I’ll link to them from here – I’ve spotted one on Blogging from the iTunes U conference, Munich Germany so far. Thanks for the link (on Twitter) to the Blackberry interface to iTunes. Apart from anything else, it is hard to knock success and I can’t argue that use of iTunesU isn’t successful. I do think it is interesting to compare institutional use of iTunesU with their use of, say, YouTube, which you talk about in your most recent post. With YouTube there is no need to build a completely parallel route to the content because it slots into the Web architecture seamlessly – everyone sees the same content by the same route – everyone cites the material in the same way. I think this is a much healthier approach. Thanks for the comment. I found the comparison you made with YouTube very informative – you’re concern seems to be based on iTunes lack of a Web-native infrastructure rather than, say, use of an out-sourced delivery channel or the terms and conditions. I agree that there is a distinction to be made with the Web-native approach (REST, RSS, ..) being, as you say, the “much healthier approach”. However there is also the question of user acceptance, so while the technological issues are important they can’t trump other considerations. As we only have a public iTunes U site, we see our presence in this arena as ‘going where the users are’ and ensuring that the content our lecturers want to be available to the world has as high a profile as possible. regarding the cost implication sof setting up an iTunes U site: I also understand from the person responsible for getting the Oxford site up and running, that this was indeed a signinficant piece of work whivch had exercised two people full time for 6 months each to get the site up and running – so that’s a person year for a kick start. They then advertised another post to carry on the work so that gives us a bit of a clure what might be required. When Apple unveiled the service and started canvassing for people to sign up for a site, they were suffesting (actually demanding) that they would only give Univerfsities a site if they could demonstrate that they had more than 400 indivisual pieces of content ready to go, and had a recurrent policy of creating new materials and keeping the materials circulating so as to keep the sites buoyant and dynamic. I was responsible for undertaking an analysis of whethe we should go down the iTune U route this time last year here at Sheffield. the problem for us (we were having a few “local ” issues at the time liske a voluntary redundancy exercise and a restructuring of our media department) was that the setup cost in terms of human resources was just too high. The essential forts step in doing this for an Instituion is to do a content audit of what suitable material you already have – and for us at the time, even this was too big an undertaking given the pressure we were under. Of course once the material has been audited, it then needs physically locating, collating, transcoding (if you have the right kit), uploading, metedata-ing (? ), and then the iTunes U site (which remember folks isn’t a hosting service by default, just an RSS farm) needs setting up, populating with RSS feeds etc. And then there’s the rights clearence issues and the fact that someone really needs to sit down and “clea” all the stuff to make sure there’s no defamation etc etc. So it’s a big job. Apple have now lowered the number of items needed to sign up so it should be less onerous now (I think about 125 will get you up and running). What both peter Scott (OU) and Peter Robisnon (OUCS) will tell you about all this though is that whast your Institution really needs to do is to look at the big picture with all of this. Both Institutions had a clear strategic aim about how they wanted to distribute media, and services such as iTunes U or indeed YouTube should really just be regarded as “channels” – diffrenet channles have different audiences and that to be comprehensive and inclusive, uyou need to have a presence on both. Some content will be appropriate for one, some another, and some for both. So this needs though as it will have technical and infratsructural implications for how this is tackled. At both Oxford and the OU I’m pretty sure they both have their own delivery infracstructure that sits outside of any external service, allowing easy re-use etc. As I said above, iTunes U is really jst an RSS farm, by which I mean it doesn’t normally hold the actual content, but just points at it, admittedly in a very nice inteface that can be very well branded. I found your blog post as a result of doing some research for our university regarding iTunesU and I found it very interesting. Personally, I feel iTunesU is a great platform but I think people need to consider the investment/resources required before jumping into developing for this platform. (PS – referenced your post here in my blog as I think it provides an excellent snapshot of UK university activity in this area.